Saskatoon, Sask. – July 8, 2016 – UFCW Canada Local 1400 has dedicated a special area of their community garden – located behind the Local’s Saskatoon office – to the Honouring Memories, Planting Dreams initiative, which acknowledges and honours residential school survivors and their families. Each heart represents the memory of an Aboriginal child lost to the Residential School system, and the act of planting represents that individual’s commitment to finding their place in reconciliation. 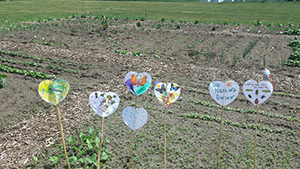 Local 1400’s Women Committee organized the planting of hand-decorated paper hearts with messages of reconciliation. This follows UFCW Canada’s support of the 2015 launch of the Heart Garden initiative by The First Nations Child and Family Caring Society of Canada (FNCFCS) to commemorate the release of the Truth and Reconciliation Commission’s final report on the Residential School system. In dedicating a portion of their union community garden to this important reconciliation initiative, Local 1400 showed solidarity with Aboriginal communities and union members, and added to the more than 3,000 commemorative hearts planted across Saskatchewan. Approximately 150,000 Aboriginal children were taken from their families by the federal government and placed in Residential Schools from the 1870s up until 1996. The intergenerational trauma and the impact of Residential School abuse faced by Aboriginal children continue to have ripple effects on indigenous communities to this day. You can find out more about Reconciliation initiatives here.